Keep wipes out of the pipes! There’s a big problem lurking in our sewers, and we need your help! Please let your family and friends know to never flush ANY wet wipes down the toilet, but instead dispose of them in the rubbish. Like water utilities around the world, we are having an increasing issue with wet wipes in our wastewater system. London, New York and all Australian water utilities are facing the same problem. 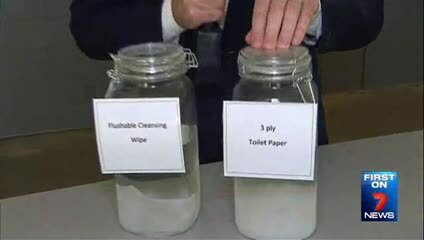 Flushed wet wipes can block pipes, which can lead to sewage overflows into homes or creeks. It's likely they can block your sewer pipes leading to a costly plumbing bill. You can avoid this all. If you have been unfortunate enough to have a plumbing blockage at your home due to wipes, please register to get involved and let us know! We want to hear your wet wipes story! 75% of sewer blockages involve flushed wet wipes. Have you experienced a sewer blockage in your household plumbing due to wet wipes? Did this leave you with a costly plumbing bill to fix? Share your grossest photos too! Thank you very much for taking the time to tell us your story. Your story will help us to educate the community about the results of flushed wet wipes. The interesting things we find at our Wastewater Treatment Plants. What is Sydney Water doing about this? Why can't I flush wet wipes? Are there any wipes I can flush? Who are flushing wet wipes?